Where was Sheryl's Earring Found? In Macross Frontier, the stage for the love triangle between Alto Saotome, Sheryl Nome and Ranka Lee was set with the final side of the triangle being established between Alto and Sheryl in episode 5 "Star Date" of Macross Frontier. It started with Sheryl losing one of her precious earrings during her first concert performance in episode 1 while Alto was carrying her in flight. A review of the concert tapes by Sheryl in episode 2 made her realize that the lost earring had fallen into Alto's Ex Gear. Seeking him out, she was able to get him to look for the earring in the "Star Date" episode. Having not found the earring in his personal effects in school, Alto call's up somebody on his cellphone only to find out that the person in charge was not around. Sheryl insists to talk to him but instead Alto tells her that he will take care of it tomorrow when he goes on duty. 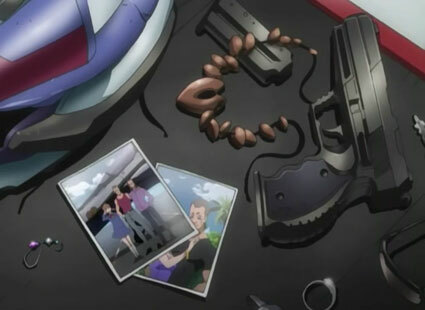 Sheryl then steals Alto's necklace and promises to give it back to him only if he shows her around Macross Frontier. It was never explicitly stated in the dialogue where Alto found the earring of Sheryl, only that he returned it to her in the succeeding episode. To which Sheryl tells him to keep it so that it can serve as a good luck charm for Alto when goes out on his first sortie as a member of SMS. So where was it in the first place? Well after having watched Episode 2 of Macross Frontier again I was able to find out that the earring had fallen into the cockpit of the VF-25 of Guilliam. It was seen on top of the toolkit where Guilliam's personal effects had been placed after his death (found on the lower left of the image below). Ozma Lee brought Alto to the SMS hangar and asked him to tell the story of how Guilliam died to the SMS crew members. Guilliam had died while trying to protect the residents of Macross Frontier from an attacking Vajra unit. Alto took over the controls of the VF-25 after seeing the death of Guilliam and the Vajra unit setting its eyes on Ranka Lee. In the plot line we find out that Sheryl Nome was the grandchild of Mao Nome of Macross Zero and that the earrings initially belonged to her.